When you stay at this apartment in Velo-Vocha, you'll be within the vicinity of Heraion of Perachora. Free self parking is available onsite. When you stay at Ari Beach in Malia, you'll be near the beach and convenient to Palace of Malia and Stalis Beach. A roundtrip airport shuttle is provided for a surcharge (available on request). 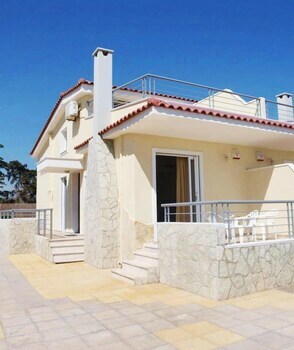 With a stay at Alexandra Makris Gialos Studios in Kefalonia, you'll be near the beach and minutes from Makris Yalos Beach, and close to Port of Argostoli. When you stay at Villa Ortansia in South Pelion, you'll be 8 minutes by car from Miles Museum Mount Pelion.